There's a lot of talk these days about buying Made in the USA — and rightfully so. To the extent consumers are able to support companies who produce products in America, they should. It helps everyone. And while there are plenty of companies producing products in the USA, few are doing so without sourcing at least some of the components globally. This is particularly true in the electronics and lighting sectors. Much of the United States capacity to produce electronic components over the past two decades has shifted to other countries. Perhaps no better example of this shift is with the iconic American company, Apple Computer (aka 'Apple'). As recently as 2002 most of Apple's products were manufactured in the United States. Today, nearly every Apple product, from Macs to iPhones, are made in Asia. It isn’t just that wages are cheaper abroad. Rather, the vast scale of overseas factories as well as the flexibility, diligence and industrial skills of foreign workers have outpaced their American counterparts. The truth is we live in a global economy. Rapid technology lifecycles has increased the competition among countries as to who can produce the newest and best in technology and then scale technology production. The only way to innovate and remain on the cutting edge is to source individual components globally from the very best manufacturers. This is not to suggest that the entire product needs to be produced overseas. In Apple's case for example all of their design and development remains within the United States. Also, much of their customer support is done from the US and they continue to source some of their components as well from within the United States. The point being in today's world smart operators source the very best components the world has to offer and combines those components with American ingenuity, marketing savvy and world-class customer service to bring best-in-breed products to consumers. At Boogey Lights® we're all about liberty and The American Way. We believe in God, guns and country. We love America. We love free enterprise. We're strong supporters of our military and their families. We believe in personal responsibility, fiscal accountability and self-reliance. We believe a smaller government is a better government. We're mostly conservative in our views and believe America is indeed an exceptional country. Born and raised in the mid-west, our team knows what it takes to work hard to build a sustainable business. We're also realistic. We know that today's consumer is more discerning with more options than ever before. They demand quality products at fair, competitive prices. So while we'd love nothing more than to be able to produce 100% of our products here in the United States, given the state of today's electronics and LED production technology doing so is neither realistic nor financially feasible. For example, the world's best light emitting diode (LED) components aren't made in the USA. They're made in Japan. So if you want the best, brightest and longest lasting surface mounted LED at a competitive price, you have to go to Japan to purchase it. The same too holds true for flexible PCB. At the present time China produces the best quality flexible PCB at the most economical price. Given these market realities our approach to producing our lighting products has been to take a page out of Apple's play book. We source our components from the world's top manufacturers and bring those components to the US where the final product is designed, assembled and supported by Americans. A quick review of competing LED lighting products for RV and motorcycle applications today reveals none of these products are 'Made in the USA'. In fact every competitor we're aware of are made overseas with very little, if anything, being done in the United States. For example, the leading RV awning light sold online and by major RV dealers across the country is 100% produced in Asia - even the printing and packaging. The product is then sold to the US market by a Canadian company. Not even the support is done in the United States. And yet this product is the #1 selling RV awning light in the country. It's also the same product being installed by most every RV manufacturer on new RVs and campers. We think this is a problem. This is why we go to considerable expense and effort to develop, produce and support as much of the products we offer from within the United States as we can while still being competitively priced. At Boogey Lights® our products are DESIGNED, ASSEMBLED and SUPPORTED by Americans in our facility in Florence, KY. We work directly with a select group of manufacturers to source the best lighting components the world has to offer. There are no distributors, jobbers or middle-men involved anywhere in the process. Our LED lighting products are produced to our specifications using manufacturers we select and supervise. Then, the product components are flown to our facility in Northern Kentucky where we complete the final assembly, testing, quality control and packaging processes. As part of the assembly and packaging processes we source the sub-components (e.g. heat-shrink, cable, fuses, wire connectors, etc) from US based suppliers. Even our product packaging is produced in the United States using printers and graphic designers in Cincinnati, OH. Our support team too as well as all warehousing, distribution, customer service and marketing is in Kentucky. 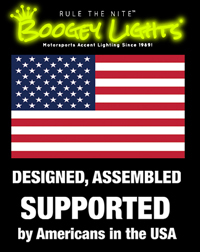 So while Boogey Lights® products aren't 100% 'Made in the USA', all of our product design, product development, final product assembly, testing, quality control, product support, packaging, distribution, warehousing, marketing and customer service is done by Americans in the United States. We have yet to find any serious competitor who produces as much of their products in the United States as Boogey Lights® does.